With spring officially here, it’s time to refresh our wardrobes, clean out our closets and get in the spirit of warmer weather. So today I have a fun casual look for you in a pretty refreshing color combo that is perfect for spring and summer. Even though now days wearing white is accepted year-round, we all tend to wear more whites during warmer months. Today I have a brand new off white cargo jacket for you that is a great piece for spring and summer. It is made out of 100% rayon fabric so it very soft and comfy. It has all of the classic cargo jacket styling features, like the two pockets, drawstring belt and tab and button detail on the sleeves so they can be worn shorter during warmer months. This jacket will look great over shorts, skirts or even dresses. I have styled this cargo jacket for you today with our Pink Ivory Stripe Shirt with Pockets which is also made out of a nice soft rayon fabric with pretty shades of pink and blue that look great together. I think that these two items complement each other very well. I am wearing both pieces with my skinny blue denim jeans with folded up cuffs for a different look. I then added our new Gold Tone Chain Necklace with Beads and Gold Pendant. 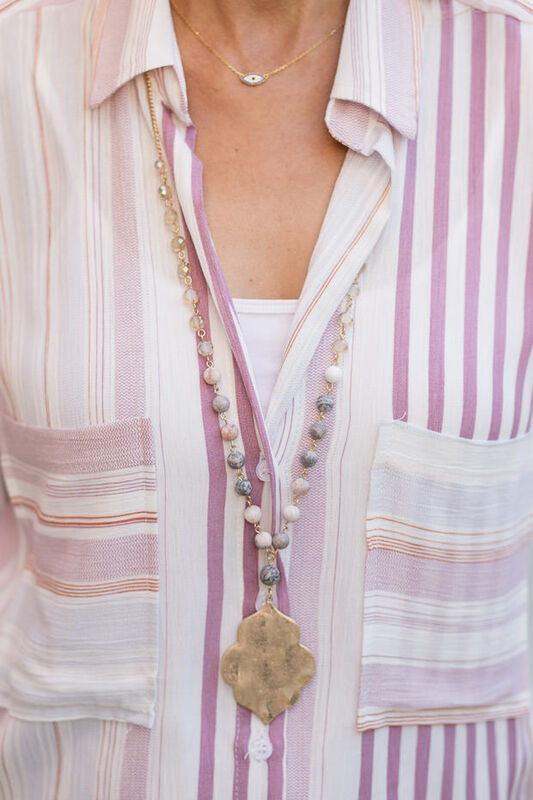 This necklace has beads that are pink and bluish gray, so it looks perfect with the shirt. As a second accessory, I added our new Blue Water Color Painting Scarf Shawl, which is a sister to our Peach Water Color Painting Scarf. 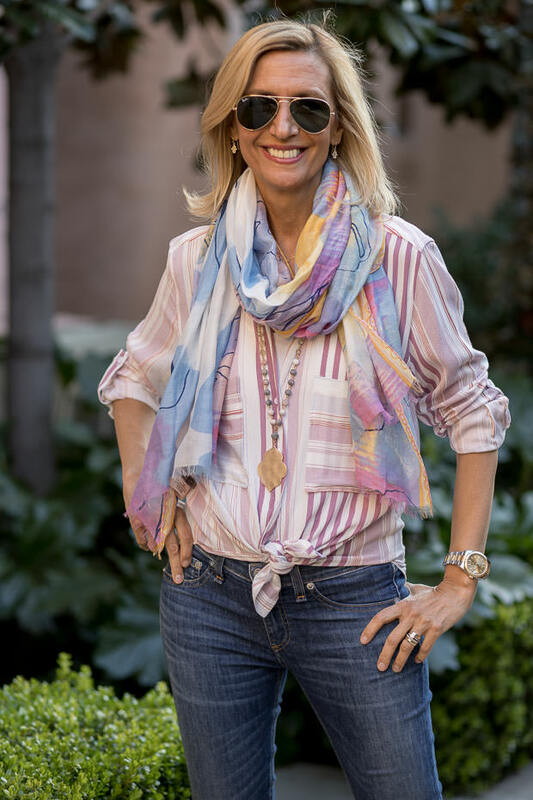 The beautiful print on this scarf is a combination of a floral and abstract water color painting and the fabric is also super soft, so much so it feels like silk. All four pieces I have styled for you here today are part of our Weekend Flash Sale where you will get 15% off any of these items with code FS33 – as always we offer Free priority US Shipping. All international shipments are a flat rate of $25.00 regardless of how many pieces you order – so its a great deal ! Have you started a spring refresh and how do you like my look today? What a comfortable looking outfit! And that color combination works very well. I love the pink striped top on you and mixed with the pretty pastel scarf a great look. Those sandals are pretty too! I am looking forward to wearing my espadrilles and more sandal season. Thank you Jess, I am looking forward to wearing more sandals as well.